The Diamondbacks added to their already enviable outfield depth today. Arizona has officially signed Cody Ross to a three-year contract with a fourth year club option, the team announced. The deal is worth $26MM, which includes a $1MM buyout of the option. Ross is an SFX client. 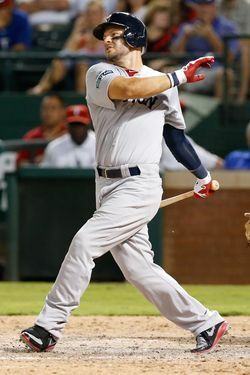 Ross, 31, was a popular free agent this offseason after hitting .267/.326/.481 with 22 homers in 476 plate appearances for the Red Sox last season. The right-handed batter was especially productive against lefties (.295/.373/.636) and at home in Fenway Park (.295/.356/.565). Ross has plenty of experience in all three outfield spots, though the various metrics say he's just average defensively. Despite trading Chris Young earlier this offseason, the Diamondbacks still have a very crowded outfield. Ross joins the incumbent Justin Upton, Jason Kubel, and Gerardo Parra, and the club also has prospects Adam Eaton and A.J. Pollock knocking on the door. Arizona is already working to trade one of their spare outfielders, and of course Upton is the big name. Kubel or Parra could also be moved to clear up the logjam as well. The Rangers, Phillies, Giants, Mets, Mariners, Yankees, and Braves were among the teams with some level of interest in Ross this winter. The Red Sox had interest in bringing him back as well, though that interest waned after they inked Jonny Gomes to a two-year, $10MM pact. MLBTR's Tim Dierkes ranked Ross as the 22nd best free agent on the market, predicting he would re-sign with Boston. Mark Feinsand of The New York Daily News first reported the agreement while ESPN's Jim Bowden added details (Twitter links). Photo courtesy of USA Today Sports Images.